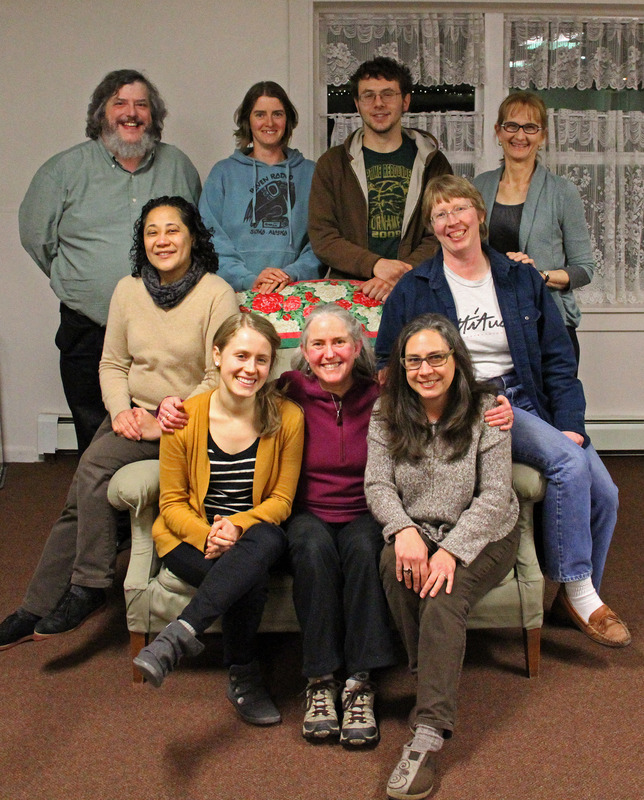 The 2017 Sitka Local Foods Network board of directors and St. Peter’s Fellowship Farm lead gardener. Back row, from left, Tiffany Justice (treasurer), Ben Timby (secretary, now vice president), Sam Pointer (director, no longer on board) and Charles Bingham (president/communications director). Front row, from left, Nina Vizcarrondo (secretary/farmers market manager), Laura Schmidt (lead gardener), Jennifer Carter (vice president, no longer on board). Are you enjoying the fresh local veggies at the Sitka Farmers Market this summer? Did you take any of our garden education classes this spring? Are you concerned about increasing access to local food for all Sitka residents? Please consider joining the board of directors for the Sitka Local Foods Network to help us pursue our mission to increase the amount of locally produced and harvested food in the diets of Southeast Alaskans. We need more board members in order to keep running our programs, especially since we recently found out two of our current board members will be resigning at the end of the summer. We really need people to step up and join the board. Our board usually meets once every 4-6 weeks, but we currently don’t have our next meeting scheduled. We try to keep our dates consistent within the month, but we sometimes will move our meetings to avoid conflicts with board member schedules, venue schedules and to insure a quorum. All of our board meetings are open to the public. The 2017 Sitka Local Foods Network board of directors and St. Peter’s Fellowship Farm lead gardener. Back row, from left, Tiffany Justice (treasurer), Ben Timby (secretary), Sam Pointer (director) and Charles Bingham (president/communications director). Front row, from left, Nina Vizcarrondo (co-secretary/farmers market manager), Laura Schmidt (lead gardener), Jennifer Carter (vice president). The next regular Sitka Local Foods Network board meeting is from 7-9 p.m. on Wednesday, April 18, at the Southeast Alaska Independent Living (SAIL) office, 504 Lake Street, Suite C (NOTE: The meeting date was changed from April 11 due to the illness of a couple of our board members). The board usually meets once every 4-6 weeks. Please note, we will sometimes move our meetings to avoid conflicts with board member schedules, venue schedules and to insure a quorum. All of our board meetings are open to the public. The 2017 Sitka Local Foods Network board of directors and St. Peter’s Fellowship Farm lead gardener. Back row, from left, Tiffany Justice (treasurer), Ben Timby (secretary), Sam Pointer (director) and Charles Bingham (president/communications director). Front row, from left, Nina Vizcarrondo (co-secretary), Laura Schmidt (lead gardener), Jennifer Carter (vice president). Are you concerned about increasing access to local food for all Sitka residents? Are you worried about rising food prices in Sitka, or do you want to advocate for more community gardens in Sitka? Please consider joining the board of directors for the Sitka Local Foods Network to help us grow in 2017. We also are trying to build up a pool of possible replacements for when we have three of our nine board spots up for reapplication at the end of each year. Sitka residents seem to want a lot of food-related projects each year (just look at this year’s Sitka Health Summit, when two were chosen), but we need board members to help make these projects happen. The next regular Sitka Local Foods Network board meeting is from 6-8:30 p.m. on Wednesday, June 14, at the See House behind St. Peter’s By The Sea Episcopal Church (611 Lincoln St.). The board usually meets from 6-8:30 p.m. on the second Wednesday of each month at the See House. Please note, we will sometimes move our meetings to avoid conflicts with board member schedules, venue schedules and to insure a quorum. All of our board meetings are open to the public. The 2015 Sitka Local Foods Network board of directors. Front row, from left, Alli Gabbert, Lisa Sadleir-Hart, and Jennifer Carter. Middle row, from left, Maybelle Filler and Michelle Putz. Back row, from left, Charles Bingham, Brandie Cheatham, Matthew Jackson, and Beth Kindig. Our 2016 board of directors (no picture available) is President Michelle Putz, Vice President Matthew Jackson, Treasurer Kathy Jones, Secretary Brandie Cheatham, Charles Bingham, Jennifer Carter, Edith Johnson, Chris Todd, and Wendy Lawrence. Due to the unforeseen upcoming loss of two board members this summer, please consider joining the board of directors for the Sitka Local Foods Network to help us finish out the 2016 calendar year. We also are trying to build up a pool of possible replacements for this winter when we have three of our nine board spots up for reapplication. Board members help direct the Sitka Local Foods Network, a non-profit that promotes the harvest and use of local food in Sitka. In addition to setting the focus of the group during our monthly meetings, board members also serve on at least one committee supporting at our three main projects of the Sitka Farmers Market, St. Peter’s Fellowship Farm, and garden education and mentoring. In addition, some board members have supported other local foods projects in Sitka, such as the Sitka Kitch, Blatchley Community Garden, Let’s Grow Sitka, the Sick-A-Waste compost project, the Sitka Community Food Assessment project, Sitka Fish-To-Schools, other school education projects and more. The next Sitka Local Foods Network board meeting is at 6 p.m. on Tuesday, May 10 (Note: this is a change from our usual meeting date), at the See House behind St. Peter’s By The Sea Episcopal Church (611 Lincoln St.). The board usually meets from 6:30-8 p.m. on the first Tuesday of each month, with a short finance committee meeting at 6 p.m. on alternate months. Please note, we may be changing our meeting dates in the near future. The 2015 Sitka Local Foods Network board of directors. Front row, from left, Alli Gabbert, Lisa Sadleir-Hart, and Jennifer Carter. Middle row, from left, Maybelle Filler and Michelle Putz. Back row, from left, Charles Bingham, Brandie Cheatham, Matthew Jackson, and Beth Kindig (note, Beth Kindig resigned from the board and was replaced by Kathy Jones). Then consider joining the board of directors for the Sitka Local Foods Network for the 2016 calendar year. Due to the pending retirements of a couple of long-time board members, we are trying to build up a pool of possible replacements to help keep us moving into the future. Board members help direct the Sitka Local Foods Network, a non-profit that promotes the harvest and use of local food in Sitka. In addition to setting the focus of the group, board members also help on a wide variety of projects such as the Sitka Farmers Market, St. Peter’s Fellowship Farm, garden education and mentoring, Sitka Kitch, Blatchley Community Garden, Let’s Grow Sitka, the Sick-A-Waste compost project, the Sitka Community Food Assessment project, Sitka Fish-To-Schools, other school education projects and more. To apply for a spot on the board, please fill out the application linked below and submit it to sitkalocalfoodsnetwork@gmail.org. For more information, contact Lisa Sadleir-Hart at 747-5985. The next Sitka Local Foods Network board meeting is at 6:30 p.m. on Monday, Oct. 12, at the See House behind St. Peter’s By The Sea Episcopal Church (611 Lincoln St.). The board usually meets from 6:30-8 p.m. on the second Monday of each month, except during the summer when board members are busy working with the Sitka Farmers Market and St. Peter’s Fellowship Farm communal garden. The Sitka Community Greenhouse and Education Center project will hold its next meeting at 5:15 p.m. on Friday, March 14, at the Sprucecot B&B and Gardens at 308 Peterson St. This meeting is open to the public. Judy Johnstone, who owns Sprucecot B&B and Gardens, is hosting the meeting. Reports will be heard from committee members on possible building sites, including the Blatchley Community Gardens site and the old float plane turnaround area on Halibut Point Road. 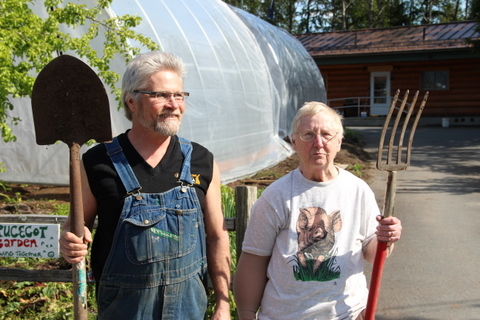 The Sitka Local Foods Network is supporting this community greenhouse project, but is not coordinating it. For more information, call Kerry MacLane at 752-0654.